This book really is terribly written but I kept on going because the content was interesting. When I say ‘content’ I don’t mean the author’s imagined contemplative and personally dramatic moments, but the statistics and the arguments that Perkins makes. The only justification for such a woefully written novel is that Perkins wants to get his message across and the way he does this is to sensationalise and make it cheesy as hell. Socialist Worker newspaper does something similar I guess – they use a tabloid format to try pick up new readers and get their views to a greater number of people. So, the end justifies the means, possibly. 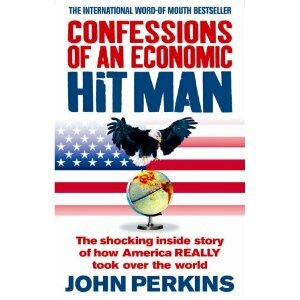 This book made me cringe with almost every sentence but it was worth reading for some of the insights into the economic world and US foreign policy. It has inspired me carry on down the non-fiction (sic) trail and to read something similar. I only wish Perkins had decided to emulate Graham Greene in his prose, who he meets in the book. Greene later wrote Getting to Know the General about Omar Torrijos – so maybe this book should be next. Soundtrack: Os Mutantes – Dom Quixote. This entry was tagged Perkins; John. Bookmark the permalink.